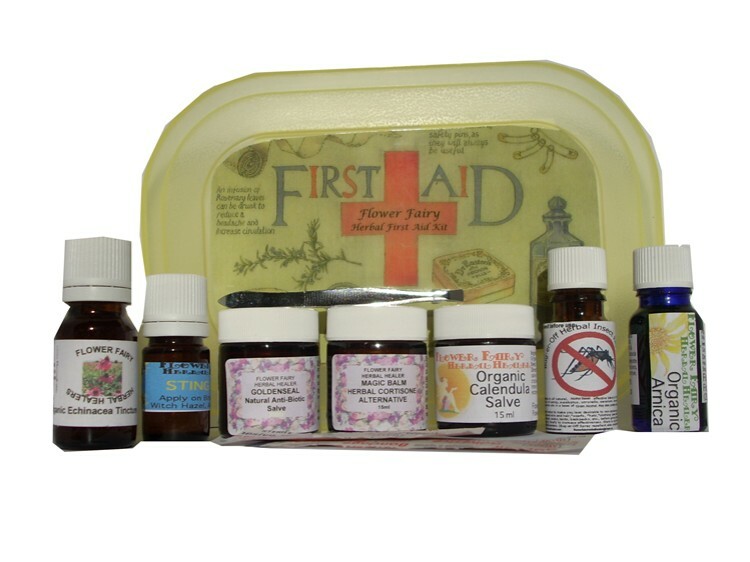 Description: This natural Herbal First Aid Kit makes an ideal alternative to traditional pharmaceutical first aid kits. Great for treating minor ailments or accidents. Great for home, travel, work, boating, camping, hiking, to keep in the car and home for emergencies and as an addition to earthquake preparation kits. Flower Fairy Herbal First Aid kit have a hand-made and effective combination of four medicinal salves for topical application for non-poisonous bites, mild burns, rashes, scrapes, chaffing, bumps, bruises, sprains, trauma, eczema, nettle burn, stings , fungal conditions, baby rash, dry skin, dermatitis, itching and chapped lips. An echinacea tincture for helping to boost the immune system against colds, flus, allergies, sinus problems and sore throats. Also included is a natural bug repellent, a pair of tweezers and band aids in a handy plastic carry case. All products have ingredients and directions on their labels. After purchase refill size bottles are available to purchase by request, of all products included in kits. The bottles/jars are all recycleable/reuseable glass and so is plastic snap-lid container. 1x 10ml Sting Stop. After bite, sting, burn, topical cooling drops. All the above come in an attractive plastic travel case (may vary from Photo) and each item has directions on them and on lid. Also included is the plastic carry case, a pair of tweezers and band aids. Directions: Studies have found Echinaceas to be beneficial for increasing immune systems and immune cells. This may help to prevent colds, lessen, the severity and duration, along with protecting your immune system from relapsing into illness soon after recovering Caution: It is not suitable for all individuals due to its immune stimulating properties. Do not use Echinacea products in general with auto-immune conditions such as rheumatoid arthritis, or for those with organ transplants, or those on immu -suppressant drugs. Avoid if you have MS, Aids or HIV,TB, or collagenosis. Tinctures such as Echinacea are traditionally made in an alcohol base. In pregnancy see a physician before consuming any herb. Ingredients: Flower Fairy Herbal First Aid kit have a hand-made and effective combination of 3 medicinal salves and one arnica oil, one witch hazel based Sting Stop drops. They have a range of uses for topical application for non-poisonous bites, mild burns, rashes, scrapes, chaffing, bumps, bruises, sprains, trauma, eczema, nettle burn, stings , fungal & candida conditions, baby rash, dry skin, dermatitis, itching, hemorrhoids and chapped lips. Also contains one herbal bug repellant, one bottle of allergy/immune tonic of echinacea. Packaged in an attractive plastic travel case All products have ingredients and directions on their labels. (Item may vary from photo).